so today is the big day (as it were) the very reason i've been pulled out here to Montenegro, it's my godparents daughter's wedding. I don't know much about the plan for today, apart from the fact that we (me + the parentals) have to taxi it to Perast before getting a boat to the Gospa od Skrpjela (the Church of Our Lady of the Rock) built in 1630 on a little artificial island. It all sounds totally gorgeous and I can't wait to see the church (hello... architecture nerd here) so i'll be sure to take a snap or two for tomorrow's post. There won't be another post today since we probably won't be getting back from the wedding reception til the small hours of tomorrow morning. Anyway, the fact that we have to get a boat to the church (this should be interesting since both myself and my mum are wearing heels today) got me thinking about boats in general. I used to take sailing lessons at my old school as part of my Navy training in the CCF (combined cadet force) and I really used to enjoy it. Anyway, we wandered down to the marina here in Tivat for a look at the boats. They had this gorgeous big sailing ship docked waiting for passengers to take little pleasure trips around the bay. 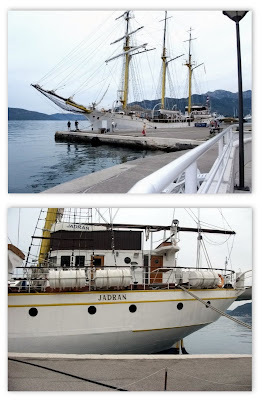 It's called the Jadran, isn't it fabulous! there were some cute little pleasure boats big enough for two or three passengers. There were a couple of slightly bigger ones with cabin space for three or four. Then we found the 'A' (more like A list) dock filled with the fabulously massive and decadently luscious yachts. I'm not joking here, they were pretty darn-tootin epic-a-mundo. One of them had about five or 6 decks, a pool on the stern (back) and what appeared to be a helipad on the bow (front). God-dammit now I want a beasting yacht! Even their names were awesome. The 'Queen K', 'Keri Lou III', 'Goldeneye' etc etc. I took this snap of them all lined up. That's about it for now. There was no post yesterday since I spent most of the day curled up in tears because of how chuffing ill I felt. I still don't feel 100%, it's getting really annoying now. I like it here don't get me wrong but I would literally give anything to be tucked up in my own bed at home right now, maybe watching Ghostbusters on my TV or just reading a book. Just to be back at home would be nice... please?!? all i've eaten in the past 3 days is the odd handful of dry cornflakes, a dry bread roll and a couple of pretzel sticks. My energy levels seem to have vanished and it takes me an extra ten minutes to do everything. In fact, since I have to be ready for this wedding by 1pm (local time) i'd better get a shift on. I'm still in my pj's and looking an absolute mess! best get going with the old GHD's and frizz ease!